(2) Providing a smooth surface to the filler to continue with primer. If the dent is very small or shallow, it may well be easier to simply carry out the repair with only bodyfiller without restoring the metal surface. Remember, bodyfiller applied in thick layers is not as flexible as the metalwork, leading to cracks and other problems especially near panel edges or on unsupported areas. Avoid deep filling on flexible panels. Assess the extent of metal damage first to make sure it really is repairable, otherwise consider panel replacement or professional help. 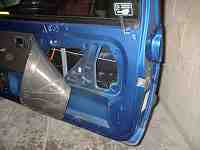 Some panels may be difficult to access from behind or inside, or may be completely closed sections. In some cases, particularly where bolt-on panels are concerned, replacing the complete panel is sometimes easier and cheaper, or a replacement may be available second-hand. Soft dents or ripples can be repaired easily, but if the damage has resulted in gouges or sharp creases anywhere on the panel this will have caused the metalwork to stretch, subsequently involving a lot more work to restore the panel to its original contours. 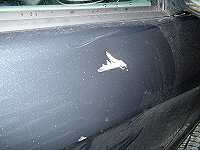 The damaged area almost always extends well beyond the obvious dents, with a slightly shallow `extension' to the damage. Depending on the access and clearance behind the damaged area, use a metal or wooden panel block under the panel supporting the deepest parts of the damage. Using a light hammer tap around the edges of the section being supported by the panel block, at the same time maintaining a steady upward pressure with the block. (See diagram) Work from the outer edges of the damage towards the center so that the surface is gently restored to just below its original contour. Avoid hammering too heavily or hitting the metal supported directly by the block as this causes the metal to stretch, ending up with a bulge where previously there was a dent. The intention for this stage is not to bring the panel back to a perfectly smooth surface, but simply to restore the metal surface to just below its original contours, with no high spots. This allows for a thin layer of bodyfiller which is much easier to shape to the exact requirements.